Are U.S. Exchange Rates Too High, Too Low, or Just Right? Exchange rate policy and monetary policy are intrinsically linked. 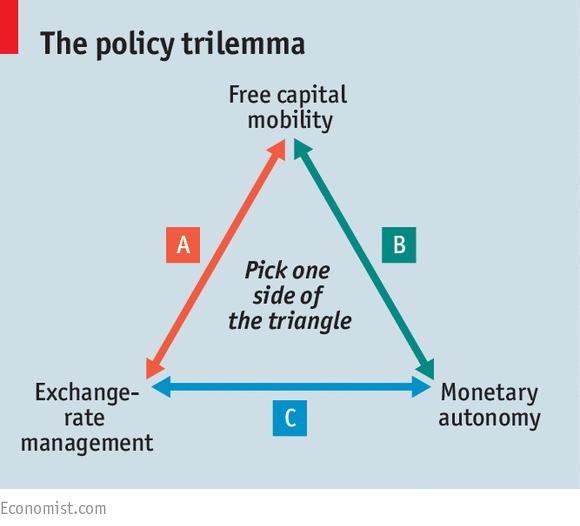 Countries face what has been called the “Impossible Trinity” or “Trilemma”; they can only choose two of the following: independent monetary policy (setting short term domestic interest rates), fixed exchange rates, and open capital markets. Thus, a country’s desire to float, fix, manage, or abandon how the price of its currency relates to others depends critically on its views toward monetary policy and the flow of capital into and out of the country. Stated differently, to some extent, all countries (including the U.S.) manipulate their exchange rates by the judgments they make about the trade-offs among the three choices. If they are too low, they hurt net importers. If they are too high, they discourage foreign direct investment and net exporters. If the rates are too volatile, then the increased uncertainty will reduce economic activity. If they are too stable, they can easily deviate sharply from what is needed to balance supply and demand for currencies. For more detail including attempts to empirically answer the question for the U.S. posed in the title go here.